Joshua Vissers/Daily Mining Gazette Cathleen Graham is a registered nurse and founder of Cannabis Nurse, a company that specializes in education about the medicinal properties and practices surrounding the use of marijuana. She gave a public presentation to community members on Thursday in L’Anse. L’ANSE — Cathleen Graham delivered a presentation about the medical benefits and dangers of marijuana to a small group of people at the Baragaland Senior Center on Thursday. Graham is a registered nurse and the founder and CEO of Cannabis Nurse, a company focused on educating the public and medical professionals in the use and legality of medical marijuana. 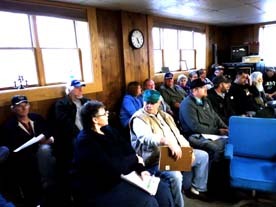 “I think that more people should attend these presentations to be informed,” Baraga County Commissioner Bill Menge said. Menge said now that recreational marijuana is here, people need to educate themselves about the potential uses and dangers of the plant-based drug. Graham said that she recognized the potential benefits of medical marijuana soon after it was legalized in 2008, but saw many people who wanted to use it struggled with dosing, consistency in product and administration methods. So she earned more than 50 continuing education credits surrounding the use of medical marijuana, launched Cannabis Nurse, and lobbied the state government to institute testing for consistency and active-ingredient labeling. The regulations that have been put in place by the Michigan Department of Licensing and Regulatory Affairs (LARA) includes “seed-to-sale” tracking, just one of the provisions which increase the safety of the medicinal product. If something is found to be wrong with some, such as being tainted with mold or salmonella, it can be tracked back through the production process and other potentially tainted products can be destroyed. As part of the newly-passed recreational marijuana law, over the first two years, $40 million is being sent to a doctor licensed by the federal government to study the impact and efficacy of using medical marijuana to treat veterans with Post Traumatic Stress Disorder (PTSD). Graham also covered the benefits and problems with different varieties of marijuana plant and methods of administering the drug. “Cannabinoids can affect each and every person differently,” she said. Each plant can have a different combination of cannabinoids, which interact with the endocannabinoid system in the human body. She also said that cannabinoids can interact with other prescription drugs. For instance, they can increase the effectiveness of blood-thinning drugs like warfarin by as much as 40 percent, which could be life threatening for some patients. Marijuana doesn’t always have to be smoked, either. It can be vaped, mixed into edibles, taken sublingually in a tincture or hard candy, put in topically lotions or patches and even suppositories. Graham thinks suppositories may be the best application, since it offers the highest bioavailability of the drug. 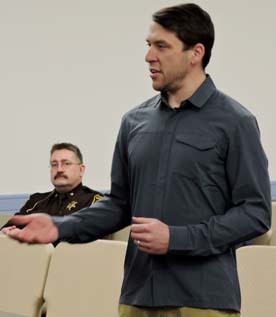 Baraga County Sheriff Rick Johnson attended the presentation, too. He said that there’s nothing wrong with medicinal marijuana, but there are always abusers, too. He said he’ll have wait and see how the issue is handled in the county. More information on Cannabis Nurse and using marijuana as a medicine can be found at cannabisnurse.com.